On January 27, 2017, Statistics Canada released economic data on Canadian cities. Canadians now have access to data on gross domestic product (GDP) for 33 census metropolitan areas (CMAs), as well as 9 non-CMA regions within the country. Going forward, the agency plans on releasing these data each year. Until now, Statistics Canada has released monthly and quarterly GDP data at the national level, and annual GDP data for the provinces and territories. In 2014, it released a set of estimates on metropolitan gross domestic product, but these were still experimental and, at the time, the agency was not planning to release them annually. However, their initial release caused such a stir that the agency decided to expand the program and release data on GDP at the local level every year. So, what is the buzz about? Why are people so keen to obtain this information? Well, it gives real, substantial insight into economic activity in Canada. Ziad Ghanem, director of Statistics Canada's Industry Accounts Division, notes that while national and provincial GDP data are exceptionally useful for providing an overall picture of the country's and provinces' economic health, these data do not provide the kind of information that allows users to assess the economic performance of Canada's cities and study its impact on city population and growth. How important are cities to the country's economic health? According to the recent GDP release, Canada's 33 CMAs generated more than 70% of Canada's national GDP in 2013. That's a big piece of the economic pie. An even closer look reveals that nearly one-fifth of the country's entire economic output comes from Toronto alone. Clearly, Canada's cities play an important role in the country's economy and warrant specific attention. With local GDP data, analysts, policy-makers and municipalities can now identify where economic growth is actually happening, and which cities are driving the economy at the provincial and national levels. This can help them develop and adopt meaningful policies to foster growth where it is flourishing, and help ignite it where it is languishing. Mr. Ghanem provides a few examples: "If you know an area is in a long-term economic decline, it might motivate interest in developing tourism or setting some kind of policies to maintain economic activity. On the other hand, an actively growing area might have other demands, such as where should we be locating universities or building infrastructure?" The wages and salaries of employees make up the largest component of local economies. They include all compensation, both monetary and other (for example, board and lodging, sick leave, military pay), given to employees in the region. Supplementary labour income refers to the contributions that employers make to social insurance plans (such as pension plans) on behalf of their employees. Mixed income is generated by the production of goods and services by unincorporated businesses, such as self-employed people. The operating surplus consists of the gross profits of corporations and government business enterprises. It includes investment income, dividends, interests and inventories, among other components. This component is the taxes that governments collect from, and the subsidies that governments give to, businesses involved in producing goods and services. Source: Statistics Canada, Industry Accounts Division. Local GDP data are expressed in nominal terms, rather than real terms. In other words, changes in GDP from one period to another reflect changes in the volume and prices of the goods and services produced, not changes in their current dollar value. In short, local GDP measures the overall wealth created by people and businesses within a given region. While these five components may appear relatively easy to measure, they are difficult for statisticians to calculate at the regional level. Much of the data used to calculate GDP are obtained from business surveys that do not provide regional-level detail. StatCan analysts, therefore, have to get data from numerous other sources to align those survey results to regional areas. When analysts put all of the data sources together, they are faced with reams upon reams of data—which they then have to go through with a fine-tooth comb. the supply and use tables. The supply and use tables are a particularly crucial data source for producing metropolitan GDP data. They are the agency's compilation of all information on economic activity in Canada. This information comes from a variety of survey and administrative sources and is then assembled into one coherent whole. The resulting tables "account for every single purchase or market transaction that takes place in the country within a given year," explains Mr. Ghanem. "That's what takes a long time." With the release of the new metropolitan GDP data, the agency is already looking for ways to shorten the time it takes to produce the supply and use tables, and ultimately to produce local GDP data. In the meantime, users can now benefit from data on metropolitan GDP to better assess economic activity at the local level and its impact on Canadians and their communities. Super useful ! More details to analyze micro-regional trends...Thx Statcan ! Thank you. StatCan is pleased by the positive response to these data. It would be more interesting to see up today tables. Information from 2009 means little when cities such as Calgary have been hit harder by oil prices and Canadian slump in the dollar. Old tables are not very useful. You are correct that GDP by city does not track the most recent changes in the fortunes of Canadian cities. 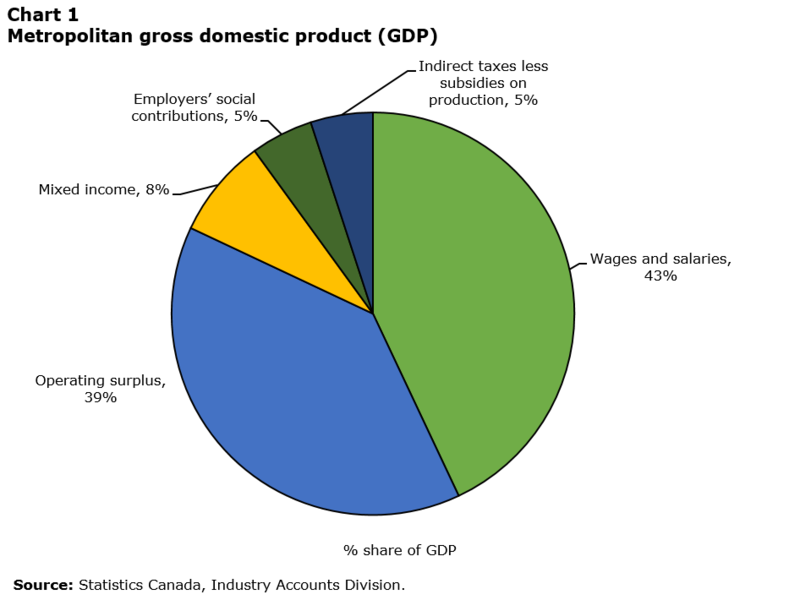 The most recent data available are for 2013. However, we hope that when GDP data are added to the full suite of StatCan products, including labour force data, they will help to inform users about the overall well-being of Canada’s regions and census metropolitan areas.